What Marinade Works with What? The E310 offers a total cooking area of 528 sq in. a warm-up basket area of 70 sq in. and warming rack area of 108 sq in. superb for small and medium outdoor family cooking. The BBQ has an enclosed cart with stainless steel doors and handles; black painted side and rear panels provide protection for foods and storage for tools. The Weber E310 has a few construction points that are rarely mentioned but play a huge role in both it’s success and may provide the answer as to why it has proved so popular over time. The main frame on the barbecue is welded, rather than riveted or bolted, this means it is not only strong, but remains very rigid with little flex. 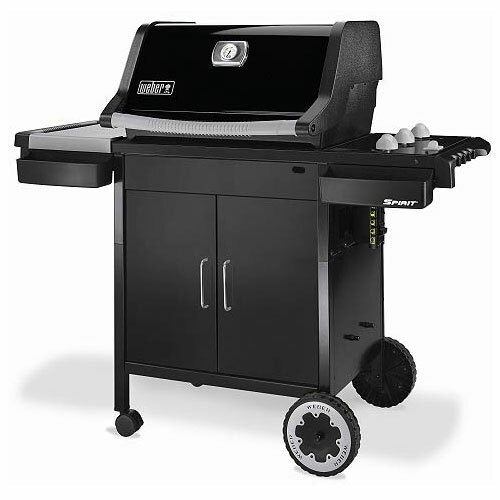 Spare parts (should you ever need them) and accessories are always available from any Weber dealer so after a few years you can replace burners, grills etc bringing it back to life without the need to replace the whole barbecue. The burners are another consideration, not only are they constructed from Stainless Steel but they are factory assembled and pressure tested, this means that there is no risk of incorrect assembly and that they will remain efficient on gas with consistent output meaning you cook evenly and quickly. This entry was posted on Thursday, March 15th, 2012 at 10:32 am	and is filed under Barbecue Tips. You can follow any responses to this entry through the RSS 2.0 feed. You can leave a response, or trackback from your own site.